NEW RICHMOND, Wisc. - July 9, 2016 - Donny Schatz and Brad Sweet battled throughout much of Saturday night's FVP Outlaws at Cedar Lake feature at Cedar Lake Speedway, as they traded the lead back and forth through lapped traffic and cautions, but it was Schatz who held tough to score his 13th World of Outlaws Craftsman® Sprint Car Series victory of the season. "I've got to thank these guys," Schatz said. "They're incredible in what they do." Schatz, who closed out the previous night at Cedar Lake with a close second place run, jumped out to an early lead in Saturday night's main event with Sweet hot on his trail. Through the first five laps, Sweet looked for a way around but Schatz held tough. "We never really can seem to get a good feel here," Schatz said. "I don't know what it is… we just had to bide our time, we were awfully tight in the beginning. I guess when you know you can't do better, you just try to save your tires. Last night I just killed the tires. We had a way better racecar at the end and that's what counts." "We qualified well tonight so we put ourselves in a lot better position," Gravel said. "I think I finished second here three times so Cedar Lake has been pretty good to me. Donny was really good - I think we needed lapped traffic. "We'll take second tonight. We've had a lot of podium finishes. Hopefully we can get some wins here. "It's a good result, good finish for our Great Clips team," Pittman said. "We've just got to figure out what's going on the first 10 laps of the race. I feel like we've been the fastest car on the race track the last 10 laps of the last couple of races. Tonight we were really good - we just gave up too many spots early. The last 10 laps were a lot of fun, we got it going in the right direction and we'll keep working at it." Sweet scored his eighth quick time award of the season after a lap of 11.581. Greg Wilson was the night's KSE Racing Hard Charger, advancing 11 positions to finish in ninth. The World of Outlaws Craftsman Sprint Car Series takes on the Brad Doty Classic at Attica (Ohio) Raceway Park on Tuesday, July 12. For more information and to learn how to purchase tickets, visit WoOSprint.com/Brad-Doty-Classic. RACE NOTES: Brad Sweet added another quick time award in 2016 - his eighth of the season… One night after finishing second, Schatz scored his 13th win of the season… The win tonight is Schatz's fifth career Outlaws win at Cedar Lake. He won on night two last season… Greg Wilson was the night's KSE Racing Hard Charger, advancing 11 positions to finish in ninth. CONTINGENCY WINNERS - MSD Ignitions ($25 cash): Clyde Knipp; MSD Ignitions ($50 cash): Donny Schatz; Penske Shocks ($50 cash): Greg Wilson; JE Pistons ($50 cash): Brad Sweet; VP Racing Fuels ($50 cash): Joey Saldana; Edelbrock ($50 cash): Greg Wilson; Comp Cams ($50 cash): Shane Stewart; Morton Buildings ($50 cash): Kerry Madsen; Cometic Gasket ($50 cash): David Gravel; Super Flow ($50 cash): Jason Sides; Craftsman/Sears ($100 cash): Willie Croft;KSE Racing Products ($100 product certificate): Greg Wilson; Comp Cams ($50 product certificate): Donny Schatz; JE Pistons (Set of Rings): Jason Sides; JE Pistons (Set of Rings): Clyde Knipp. 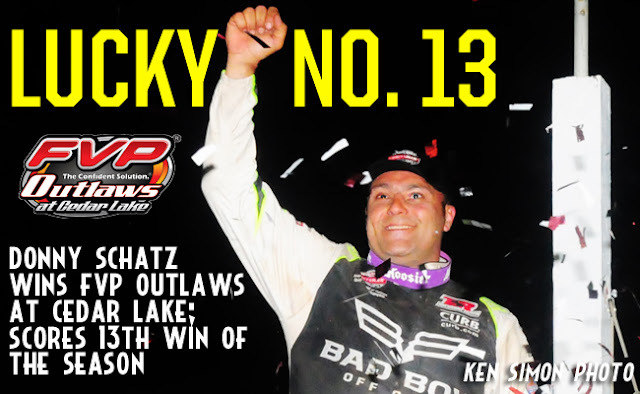 SEASON WINNERS: Donny Schatz - 13 (Volusia Speedway Park on Feb. 14, The Dirt Track at Las Vegas on March 4, Stockton Dirt Track on March 18, Stockton Dirt Track on March 19, Silver Dollar Speedway on April 2, Lincoln Speedway on May 19, Weedsport Speedway on May 22, Lincoln Park Speedway on June 8, Knoxville Raceway on June 11, River Cities Speedway on June 17, Rockford Speedway on June 29, Badlands Motor Speedway on July 3, Cedar Lake Speedway on July 9); Brad Sweet - 7 (Volusia Speedway Park on Feb. 13, Volusia Speedway Park on Feb. 14, Cotton Bowl Speedway on Feb. 26, Ocean Speedway on April 1, Bakersfield Speedway on April 15, Plymouth Speedway on May 13, Badlands Motor Speedway on July 2); Daryn Pittman - 5 (Royal Purple Raceway on Feb. 27, Perris Auto Speedway on April 16, USA Raceway on April 18, New Egypt Speedway on May 24, Jackson Motorplex on June 24); Shane Stewart - 5 (Arizona Speedway on March 6, Devil's Bowl Speedway on April 23, Lawrenceburg Speedway on May 30, Granite City Speedway on June 15, Brown County Speedway on June 19); Joey Saldana - 4 (The Dirt Track at Las Vegas on March 3, Devil's Bowl Speedway on April 22, Jacksonville Speedway on May 4, I-80 Speedway on June 22); David Gravel - 3 (Thunderbowl Raceway on March 12, Tri-State Speedway on May 14, I-96 Speedway on June 6); Kerry Madsen - 2 (Eldora Speedway on May 6 and 7); Bill Balog - 1 (Beaver Dam Raceway on June 25); Lance Dewease - 1 (Williams Grove Speedway on May 20); Chad Kemenah - 1 (Fremont Speedway on June 3); Jason Johnson - 1 (Placerville Speedway on March 24); Terry McCarl - 1 (Knoxville Raceway on June 10);Logan Schuchart - 1 (Cedar Lake Speedway on July 9); Jason Sides - 1 (I-30 Speedway on April 26); Greg Wilson - 1 (The Dirt Track at Charlotte on May 27). World of Outlaws Craftsman® Sprint Car Series Statistical Report; Cedar Lake Speedway; New Richmond, Wisc. ; July 9, 2016.